The Abu Dhabi National Oil Company (Adnoc) said it is moving ahead with plans to expand the capture, storage and utilization of carbon dioxide (CO2) produced from either the Habshan-Bab gas processing facilities or the Shah gas plant. A decision on which plant to capture the CO2 from first will be taken in 2019. The project will be engineered so as not to interrupt ongoing production from either facility. The additional CO2 capture will reduce Adnoc’s carbon footprint – which is among the lowest in the industry – and liberate natural gas, previously used for oil field injection, for other more valuable purposes, while simultaneously addressing growing global demand for oil by boosting recovery from its maturing reservoirs. The announcement was made at the International Carbon Capture Utilization and Storage (CCUS) Summit, in Edinburgh, by Omar Suwaina Al Suwaidi, Adnoc executive office director, who led Adnoc’s participation at the summit. The event was attended by global energy ministers, chief executives and senior leaders from international oil and gas companies, as well as the financial community. The discussion at the event is focused on accelerating investment in CCUS technology, which has the potential to significantly support global CO2 emissions reduction, as well as unlock value across economies, including in the UAE. 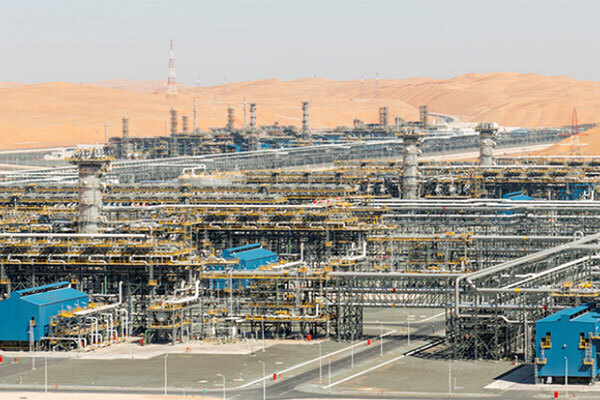 The Shah plant – built and operated by a joint venture between Adnoc and Occidental Petroleum Corporation – is one of the world’s largest facilities processing ultra-sour gas. It processes about 1.3 billion standard cubic feet per day (scfd) of sour gas and associated condensates, which contain over 20 per cent hydrogen sulfide and 10 per cent CO2. By 2025, modifications to the facility would enable the gases to be captured as part of the sulfur recovery process and converted into pure CO2 for enhanced oil recovery (EOR). Using advanced CCUS technology, more than 2.3 million tons per annum (120 million scfd) of CO2 are planned to be captured and safely locked away underground. Meanwhile, the Habshan and Bab complex could capture another 1.9 million tons per year of CO2 (100 million scfd). The complex can process up to 6.2 billion scfd of associated gas, making it the largest in the UAE and one of the biggest in the Gulf. Speaking at the summit, Omar Al Suwaidi said: “Adnoc’s experience at Al Reyadah, the only commercial CCUS facility in the region capturing CO2 from a steel plant, gives us a robust position to build on our successes and expand our CCUS capacity, where commercially viable. Adnoc has drawn up an ambitious plan to capture CO2 from its own operations, using more cost-effective second- and third-generation carbon capture technologies to meet a six-fold increase in the utilization of CO2, for EOR. Adnoc plans to capture about 5 million tons of CO2 per year (250 million scfd) before 2030. Currently, Adnoc has the capacity at Al Reyadah to capture 800,000 tons of CO2 annually from Emirates Steel Industries (ESI). The CO2 is compressed and dehydrated before being transported through pipelines for injection into reservoirs at the Rumaitha and Bab oilfields to boost oil recovery. In the oil industry, CCUS technology works in three stages. Carbon dioxide is first captured on site, and then it is compressed and dehydrated. Finally, it is transported by pipeline for injection into oilfields, where it can be used to enhance oil recovery. Using primary and secondary (waterflood) recovery techniques, between 30-35 per cent of oil is recovered on average. At Adnoc, the use of CO2, to help maintain reservoir pressure could increase end-of-life recovery to up to 70 per cent.